Hunter | Corby's Collision, Inc.
Corby’s Collision is a Full Service Body Shop. We do everything from repairs to alignments. 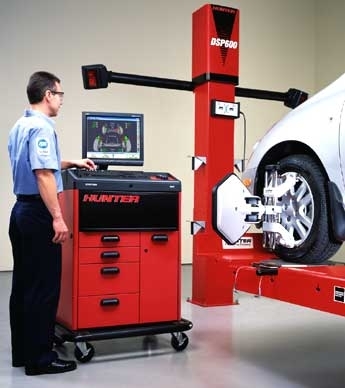 We are one of maybe only 2 body shops in Solano County that have an alignment rack. By owning this piece of equipment, we not only can be full service but, we save our customers a lot of time and are able to return their vehicle to them in a more timely manner. We use the top of the line Hunter Engineering alignment machine. This machine features the latest in alignment system technology including the new DSP600 Digital Imaging Alignment sensors for Picture Perfect® alignment. Our rack has been lowered into a pit where other shops have the rack above ground. This allows us to align cars that are low to the ground as well as duallys, big trucks, extended cab, and crew-cabs. Corby’s is able to service its own customers, along with the customers of 3 other body shops in the town of Vacaville. Check out Hunter Engineering Company’s brochure to read more about the Hunter DSP-600 or visit their website.